The current US Champ was slated to appear tonight on Raw. With the anticipation of the Superstar Shake Up gripping WWE fans and Superstars alike, it appears that outside forces are changing up some of the plans. Wrestlingnews.co is reporting that in addition to travel issues for some superstars on their way to tonight's show in Montreal, US Champion Samoa Joe was supposed to appear in a segment but it had to be pulled because he is dealing with the flu. Samoa Joe won the US Championship on the SmackDown before the Fastlane PPV. He defended it again at Fastlane and choked out Rey Mysterio in less than a minute at WrestleMania 35. Braun Strowman confronted the Samoan Submission Machine on last week's show. WWE has huge plans for the major PPVs and the Superstar Shake Up is almost as important as 'Mania because it sets up each show for the rest of the year. 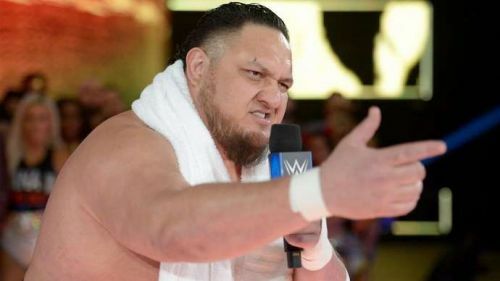 One name that might have been changing shows was the current US Champion, Samoa Joe, and his confrontation with Braun Strowman might have hinted at a move for one of those men last week. A segment between Joe and Strowman was apparently booked for tonight, but reports suggest that a lot of rewriting is being done due to travel issues. They did not specify exactly what those travel issues were, but regarding Samoa Joe, they report that he is sick with a bad case of the flu. A segment was planned for Joe and Braun Strowman, but due to Joe being sick, it was pulled. We'll have to sit back and watch how WWE works around Joe's issues and the apparent travel issues. It might be strange not to see certain superstars if they are having travel issues, but WWE has plenty of time beforehand to know who is available and who isn't.